Two Sundays ago, I sat on a panel discussion, moderated by former CBS newsman Randall Pinkston, on “the future of journalism.” The panel was broadcast on Al Jazeera America, during one of its last live weekend shows. The two-and-a-half-year-old news network was, in effect, airing its own wake. Ever since the Qatar-based Al Jazeera network launched its virtually all-American-staffed channel in August 2013, AJAM TV and its website have racked up an impressive series of Emmy and Peabody awards—but very few viewers. AJAM reported on, and often revisited, the sort of corporate-unfriendly stories the Big Three cable channels tend to ignore—on labor, refugees, poverty, social justice, climate change, inequality—a veritable feast for Nation readers. It reported on the lead crisis in Flint long before Rachel Maddow did. It regularly covered Native Americans, going far beyond “the stereotypical ‘sad life on the rez’” stories, wrote AJAM producer Tristan Ahtone, who contributed to the site’s dedicated vertical Indian Country. “There was nothing like it at any other mainstream news outlet in the United States,” he said. On January 13, AJAM announced to its stunned staff that it would shutter the website and TV channel, laying off about 700 people across 12 US bureaus. Then, two weeks ago, the parent company, Al Jazeera Media Network, announced that an additional 500 people will be let go worldwide, most of them in the Qatari capital of Doha. Like it or not, some of the best fact-based, socially liberal TV reporting in the United States in recent years has been paid for by a tiny emirate that juts into the Persian Gulf just south of Iran. Qatar is a Western outpost, host to the US CENTCOM forward headquarters, from which many of our battles in that part of the world are launched. Made fantastically rich by an enormous natural-gas field off its coast, Qatar is the wealthiest nation per capita in the world. The royal family has been on an art-buying spree—it paid more than a quarter of a billion dollars for Paul Cézanne’s The Card Players, making it the most expensive painting in history—for more than a decade. And, beginning 20 years ago, Qatar created what has become one of the world’s largest and most successful media companies: First, in 1996, the Arabic-language network Al Jazeera was launched; in 2006, the even larger Al Jazeera English (AJE) followed. Throw in its numerous sports and children’s channels and, all told, the company claims to reach “270 million households in more than 140 countries,” with more than 70 news bureaus around the world. While Al Jazeera’s nonpartisanship cred has been recently tarnished, it is relatively enlightened and generally respected. In fact, it’s often compared with the BBC. But when Al Jazeera America was introduced, it was as though the network was all ready to play soccer, only to find itself on a baseball diamond. On the other hand, the name and the logo alone may have doomed AJAM. For lots of people, Al Jazeera (it means “peninsula,” which is what Qatar is) might as well have been “Al Qaeda.” In his faux conservative character, Stephen Colbert told AJAM primetime anchor John Seigenthaler, in 2014, that the stylized flame logo “is terrifying. That is not only Arabic, it looks like Arabic on fire. It looks like exploding Arabic. Why shouldn’t I be afraid of Al Jazeera?” Seigenthaler laughed nervously. 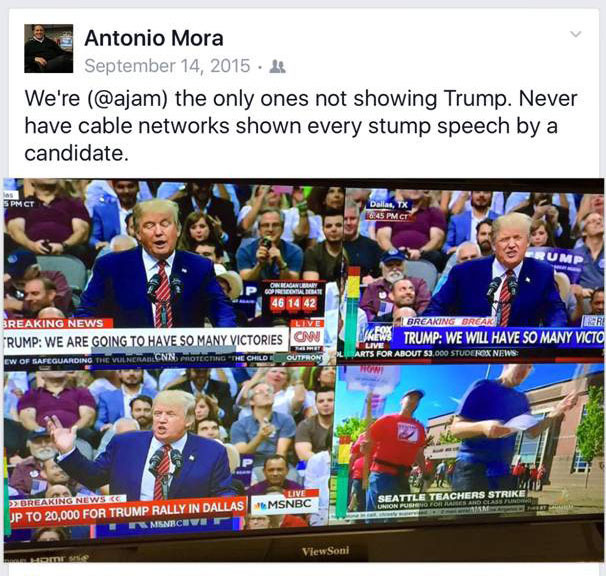 Instead, as AJAM got up and running, the desperation of Middle Eastern politics began to put a real stress on Al Jazeera’s reputation for impartiality. In July 2013, the Egyptian military overthrew president Mohamed Morsi of the Muslim Brotherhood. Qatar had supported Morsi, and for that, the general turned president Abdel Fattah al-Sisi threw three Al Jazeera journalists into prison on spurious allegations that they were broadcasting false news on behalf of the Brotherhood. The charges gained a resonance when one of the journalists, Mohamed Fahmy, sued Al Jazeera for $127 million, saying the network showed “epic negligence” by putting his and his two colleagues’ lives in danger. Earlier this year, Al Jazeera refuted the charges, and sued the Egyptian government for $150 million. As the Arab Spring receded, Al Jazeera began to be seen, at least by The Economist, as less of a universal, just-the-facts-ma’am, scientific presenter of current events and more as an extension of Qatari foreign policy. 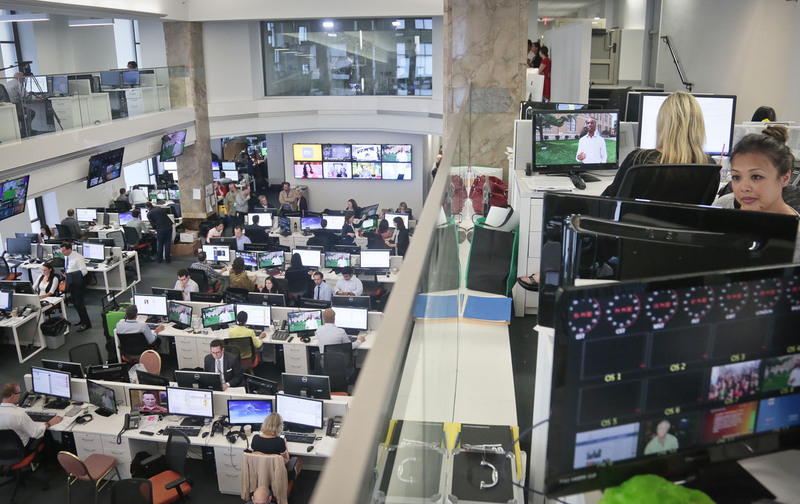 In the United States, where it stood out for its independence, especially among the other cable-news networks, AJAM was left as a sort of ghost limb, producing excellent journalism, on real issues, that nobody was really watching. AJAM’s farewell celebration begins tonight at 6 EST.